How long do you need to travel around the Philippines? How long is a piece of string? 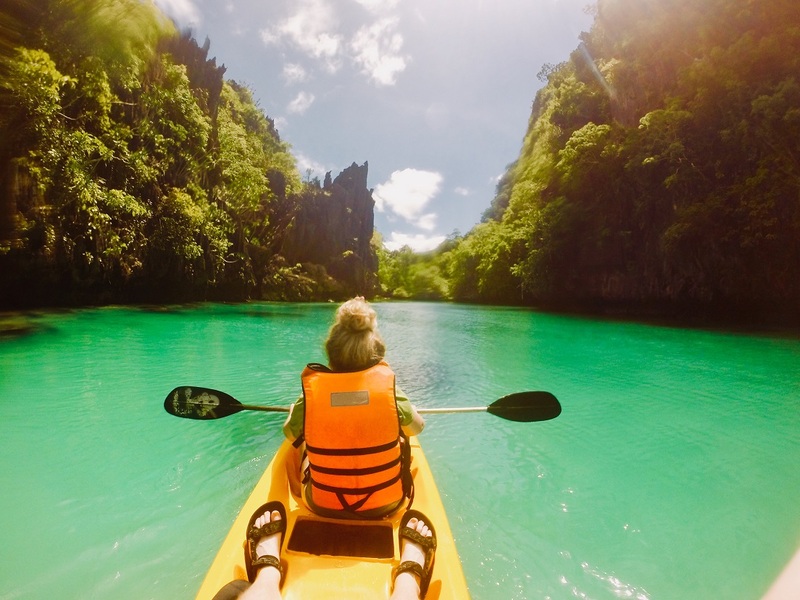 Two weeks should be plenty of time to get a taste of the Philippines and see the main sites, right? Wrong. 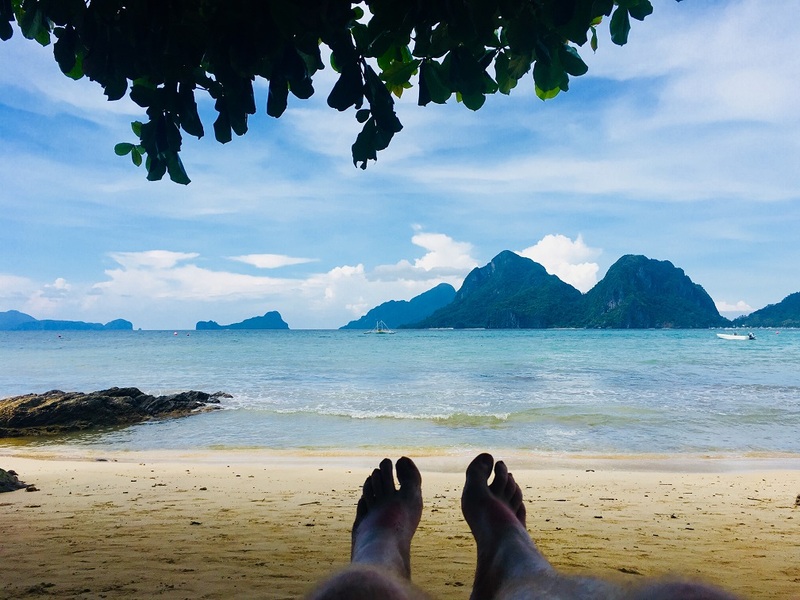 Two planes, two overnight buses, four six hour van journeys, one metro train and twelve tricycle rides later, and we’ve visited a grand total of two the Lonely Planet’s recommended ‘must see spots’ on this collection of over 7,000 islands. The places we visited were beautiful and virtually empty of other tourists, but there were reasons. One: it’s a serious challenge to get around. We took off from Shanghai at 1am and landed in Manila at 5am. It wasn’t the greatest choice of flight timing that I’ve ever made, and Manila wasn’t the easiest or most welcoming city to arrive in. 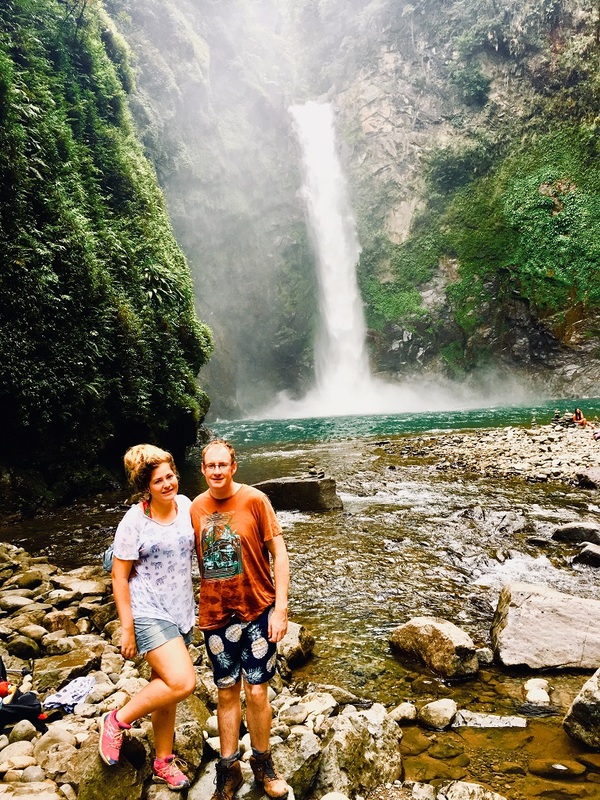 We had heard conflicting opinions about the merits of spending time in Manila – some people felt there was lots to do, while most others reported a polluted, congested, dirty experience, and suggested skipping Manila altogether. Having spent a little (albeit limited) time in the city, I have some sympathy for both views. The traffic was terrible, the city wasn’t particularly attractive and the poverty (and inequality) was evident, but I’m sure that with a little time and perseverance, Manila contains some diamonds in the rough. As we didn’t have a lot of time, and I wasn’t in a ‘persevering’ mood following our night flight, we opted to spend our day in Manila getting some much needed sleep in an interesting ‘pay-by-the-hour-hotel’ (which, despite reviews to the contrary, was pretty much as seedy as it sounds), and eating at a nearby Pizza Hut, where a large pizza cost just 140 pesos (£2). 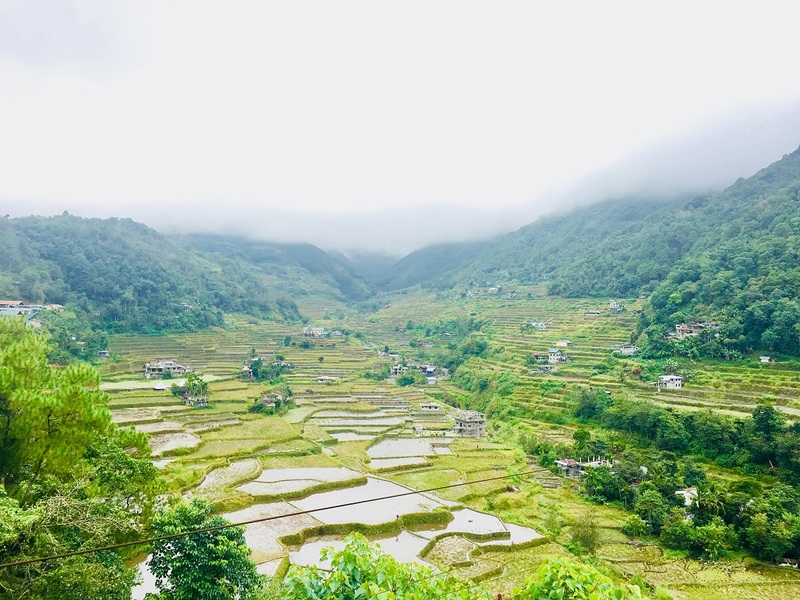 At around 9pm, we left our hotel / brothel behind, and took a 10-hour night bus up North to the small town of Banaue, nestled on the edge of some spectacular rice terraces. “Is it low season?”, we asked. “No, actually this is the start of our peak season”, he replied. “Is it the weather, maybe?”, we wondered (it had rained pretty much every day since we arrived, although the green countryside made us suspect that rain was a common feature of the area). “No, I don’t think so”, he answered. Shane and I looked at each other. There was a war on? We didn’t ask too many more questions for fear of sounding like complete idiots, but when we inevitably googled the Philippines later, we found that, yes, there is a war taking place between the military and insurgent groups, and yes, the Foreign and Commonwealth Office does advise against all travel to certain parts of the Philippines, with specific warnings relating to Manila (where we had just been), and Palawan (where we were going next). Still, at least it was quiet. We put the war and potential terror threats to the back of our minds, and enjoyed our time in the leafy, rainy North. 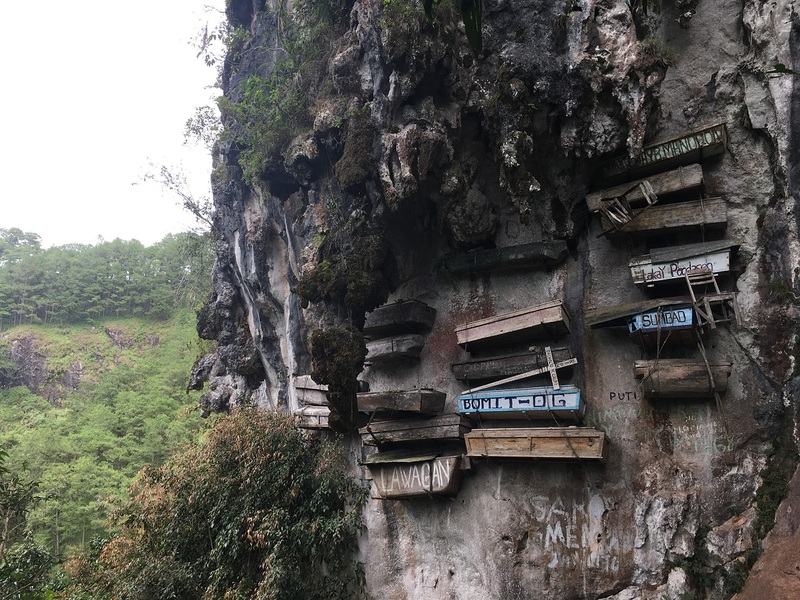 We visited hanging coffins in Sagada, and went spelunking in a cave. Spelunking involved discovering an underground water world, rappelling down the wall of the cave, accidentally grabbing on to a pile of bat poo in order to stay upright (more than once), and putting a great deal of trust in our guide to help us through the narrow passages and down the sharp drops. 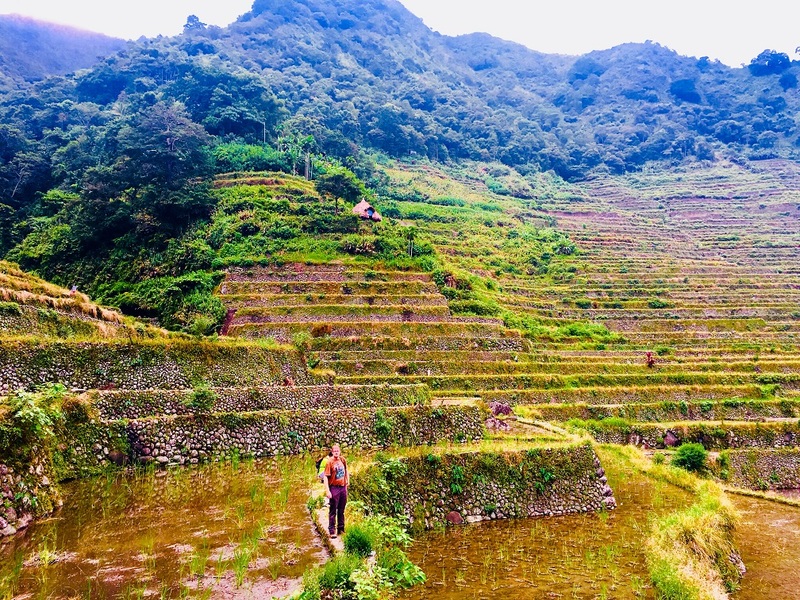 We also spent two days trekking through the rice terraces to villages nestled in the middle and cooled off by swimming in the Tappiyah waterfalls. While the walks were hard, the scenery was stunning and the villages were idyllic. After three days of hiking, it was time for a change of scene. We were going to the island of Palawan for some relaxation at some of the most beautiful beaches of the Philippines. The only problem was that we had to get there first. First we took a tricycle from our homestay to the bus stop. We were told that although the bus was due to leave at 6pm, it often left early, so we should be there at 4.30pm, just in case. Of course, the bus was late, and when it did arrive, it was different to the bus we had booked. I had splashed out an extra $2 for the ‘super deluxe’ bus (with a toilet, reclining seats and various other amenities, which I felt were worth it as the trip would last for ten hours), but the bus that arrived had none of these features. When I queried the (lack of) facilities on board, I was told that “we don’t have” the super deluxe bus, and was eventually given 110 pesos – the difference between the price of the ‘super deluxe’ bus I had already paid for, and the ‘semi deluxe’ bus which had turned up. Our ‘semi deluxe’ (ordinary) bus had other differences. Rather than being a non-stop service, it stopped frequently for people to get on, get off, get on to try to sell their snacks and souvenirs, and get off again. Sleeping went from difficult to impossible, and we resigned ourselves to staying awake all night. When we arrived at the bus station in Manila, we found it easier than expected to find a taxi, despite it being the middle of the night. In fact, there were about twenty taxi drivers waiting for our bus to pull in, and two ended up having a fight over who would take Shane and I to the airport. Eventually, we had a winner, and within half an hour we reached Manila airport, and shortly afterwards we caught a plane to Puerto Princesa on the island of Palawan. In Puerto Princesa we found an air conditioned van going to El Nido, our final destination. We boarded the van on the understanding that we would be transferred to our hotel, and tried to get comfortable and relax on what would be another long journey. The van brought us to El Nido bus park, and from there we had to take a tricycle to our hotel. We reached our final destination at 4.30pm, a full 24 hours after we first set off from Banaue. It would have been quicker to fly back to Europe than it was to travel from one island to another within the Philippines. 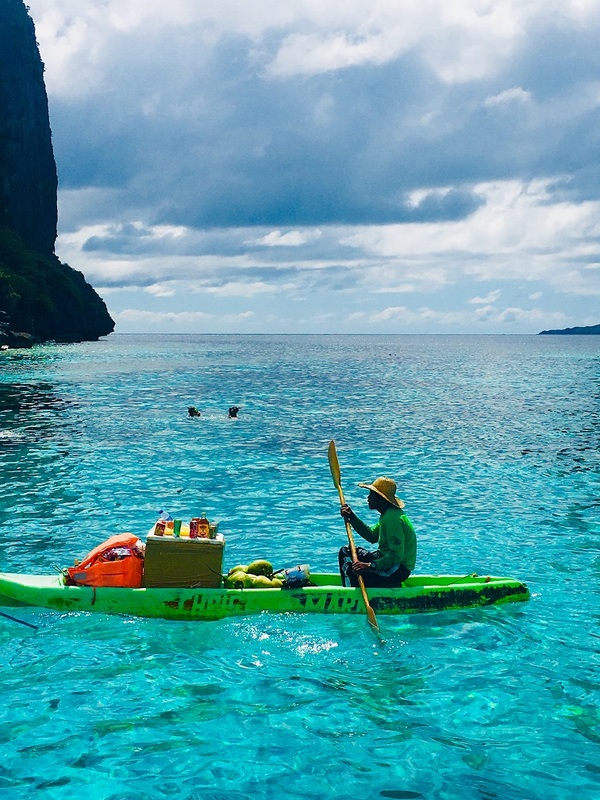 We spent five days in El Nido, touring some of the 45 nearby islands and inlets. 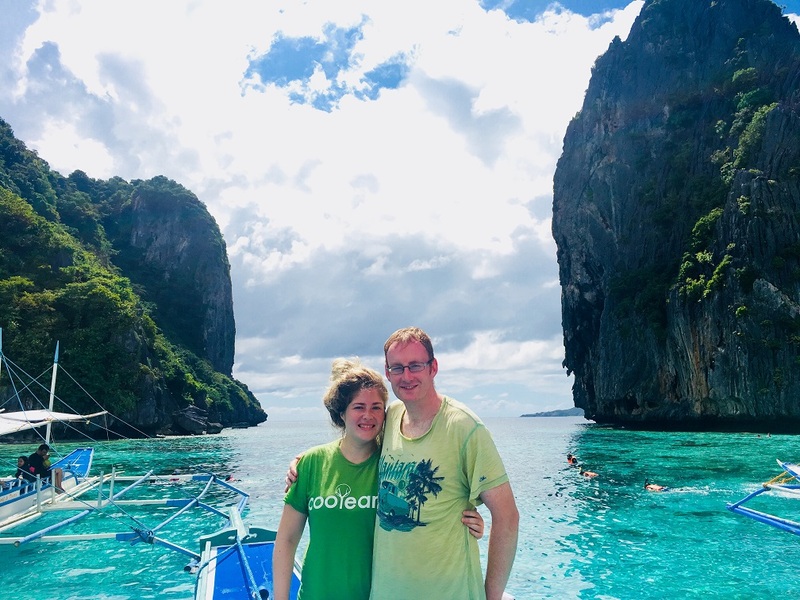 We lazed on the beach, snorkelled in the sea, kayaked through some beautiful lagoons and even took the longest zip line in the Philippines from the main island to a nearby smaller island. The beaches were filled with white sand and green palm trees, the water was warm, clear and teeming with life, and no doubt due to the travel warnings about war and terrorism, we practically had the place to ourselves. Yet, El Nido wasn’t quite paradise. The town itself was crowded with tricycles trying to sell you a ride, and shops trying to sell you a tour. There were frequent power cuts – one lasted 14 hours – which caused everything to black out, including traffic lights. Apparently this was all considered normal, as 24/7 electricity only reached the island of Palawan in 2015, and even then, it clearly still doesn’t work all the time. 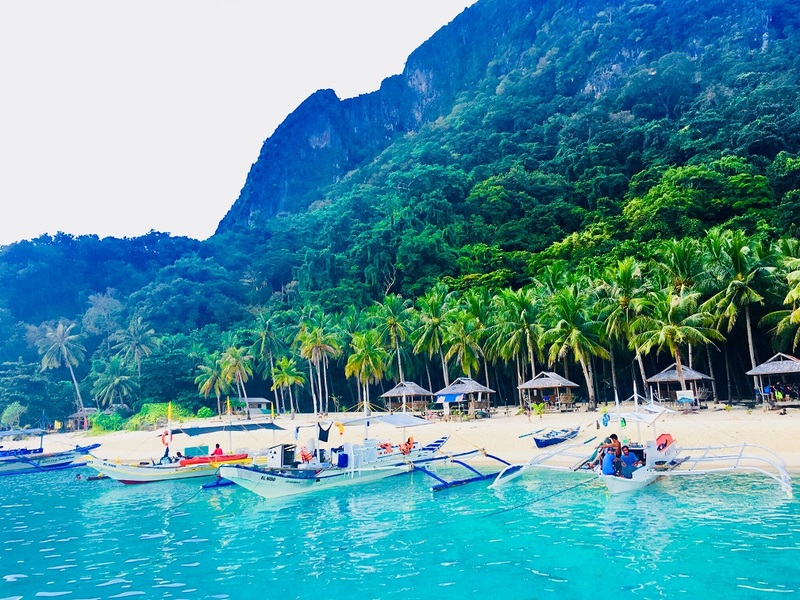 To really experience the beauty and wonder of island life, visiting El Nido and bearing the frustrations involved wasn’t enough – we had to venture off on a boat to the some of the nearby beaches and islands. Thankfully, there were plenty of them. Thirsty and in the middle of the ocean? Have no fear, the floating shop is here! While the sights and scenery were truly spectacular, backpacking in the Philippines hasn’t been easy. Long bus rides, power cuts and even longer bus rides make it challenging place to travel, although as Shane notes travelling through the countryside was beautiful. Looking out of the window we saw mountains, villages, farms and wildlife. 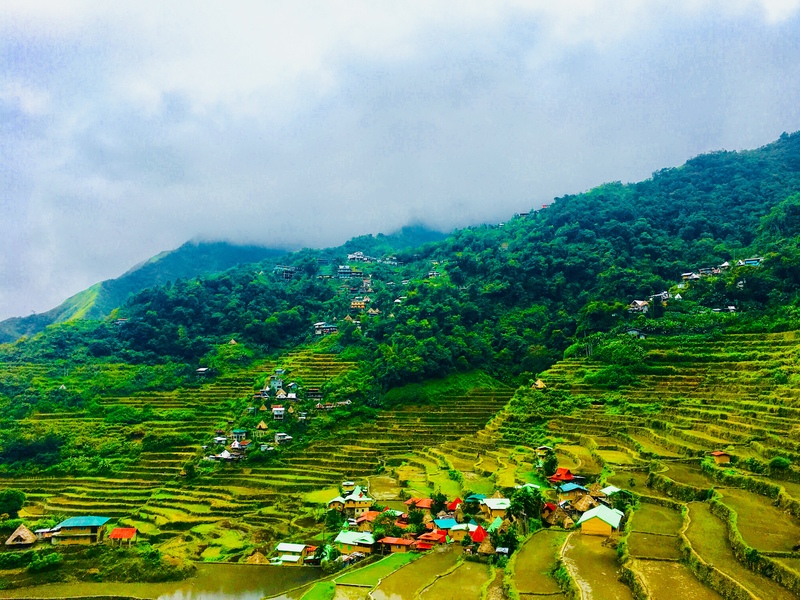 In another country, such long journeys might become tiresome, but in the Philippines, the green luscious unspoiled landscape is a destination in itself. 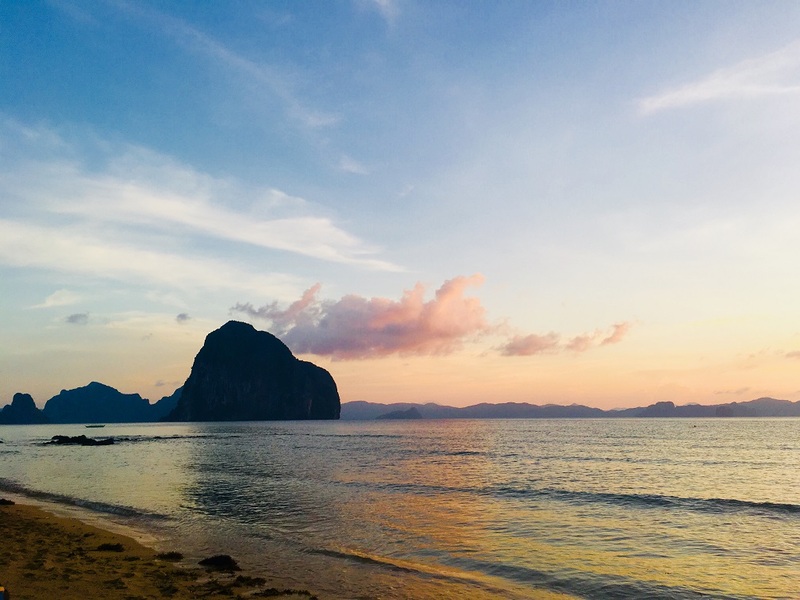 It turns out that two weeks in the Philippines doesn’t get you very far, but is just enough time to experience plenty of buses, beaches, blackouts and beauty.